Iris Carlton-LaNey is a full professor in the UNC School of Social Work and has taught in the UNC system for over 35 years, the last 20 at Carolina. Throughout her career, Iris has advocated for social justice and has served as a mentor to social work scholars throughout the country. 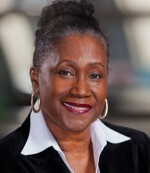 She has received several national awards for her work including the Distinguished Recent Contributions to Social Work Education Award (from the Council on Social Work Education) and the Feminist Scholar Honoree recognition from the Council on the Role and Status of Women, the Sisters of the Academy (SOTA) Legacy Award, the Distinguished Achievement in Social Work Education Award presented by the National Association of Black Social Workers, and the UNC Distinguished Teaching Award for Post-Baccalaureate Instruction. In 2015 she was selected as a Social Work Pioneer by the National Association of Social Workers. Iris received her bachelor’s degree from North Carolina Agricultural & Technical State University where the complex themes of inclusivity and social justice were nurtured. She received her master’s in social work from the University of Chicago and her PhD from the University of Maryland (Baltimore) School of Social Work. She is from Warsaw, NC and has been married to her husband, Marion LaNey, for 34 years. They have one son Marion LaNey III. Dr. Carlton-LaNey’s award citation will be posted after the Light on the Hill Society Scholarship Awards Gala on Nov. 6, 2015.